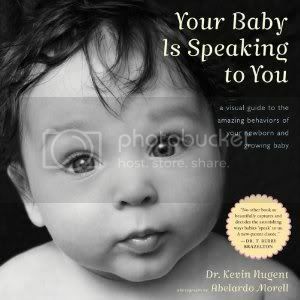 I was excited to review "Your Baby Is Speaking to You: A Visual Guide to the Amazing Behaviors of Your Newborn and Growing Baby, written by Kevin Nugent, because I wanted to make sure that I was doing everything in my power to understand my son. He was six months and although I felt pretty confident, there was a tiny voice in the back of my mind saying, "What if you're wrong about you think he's telling you"? "Your Baby Is Speaking to You" discusses the meanings behind the actions of a newborn, including the meanings of the different types of cries and smiles. It also discusses the major milestones of baby development, such as crawling and taking their first steps. First off, this book has beautiful photos. I love black and white photos! Each chapter has a corresponding black and white photo of a baby that matches the context of the chapter. I loved the fact that this book was an easy read. The chapters were nice and brief. I love the fact that Dr. Nugent did not use jargon-filled text that was dry. As I read this book, I imagined my son throughout! As I read the chapter on crawling, I watched as my own son was learning to crawl! I have read many baby books, but I still learned some new facts from Dr. Nugent's book. For example, I couldn't understand why my son fusses when my daughter is trying to play with him on the floor. I realized after reading this book that he's fussing because he's overstimulated. My daughter tends to place numerous toys in front of him and he must be fussing because he doesn't like it. Since I read this, I have been quick to intervene and remind my daughter about this. I then give him one toy and remove the others. Dr. J. Kevin Nugent is the Founder and Director of the Brazelton Institute at Children's Hospital in Boston and is on the faculty of the Harvard Medical School in the Department of Pediatrics. He is also Professor of Child and Family Studies at the University of Massachusetts at Amherst. I loved reading this book and loved viewing the photos! I would definitely recommend this book to new parents. Following from the weekend blog hop. Hope you can visit and follow back. I've got 10 giveaways and a giveaway linky that could use some loving if you've got a second, too.